Early Booking Offer – Book early and save up to 20% off the room rate. Please contact us for further details. 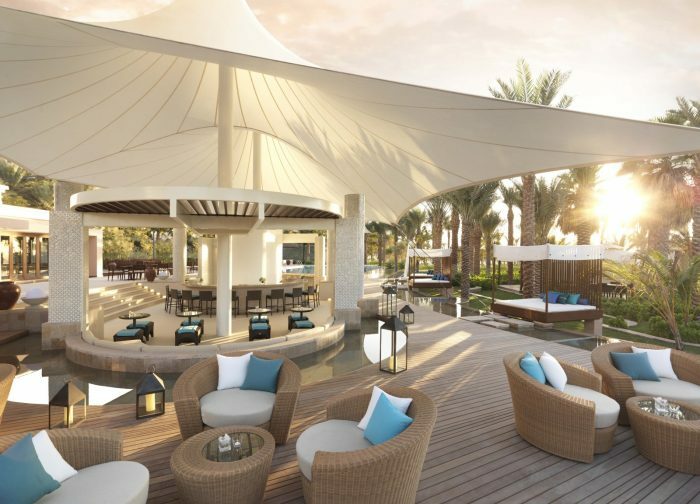 Ritz-Carlton Dubai is a fabulous luxury property located on a private beach. The cosmopolitan interiors with soft tones accentuates the beauty and lends itself ultimately to the Arabian vibrant Gardens that surround the Ritz. With only 294 rooms, each room has a private balcony to pass your evenings if you so wish or indulge in the marble bath tub. The wellness spa provides an intimate sanctum to unwind, experiencing wonderful signature treatments. The spa also offers a private spa pool and Hammam scrub rooms rich in Arabian culture. The warm golden sands are ideal to build sandcastles and soak up the sun, intoxicated by the sea breeze and the waters so peaceful that you soon forget what day it is. The kids club is a wonderful retreat for families and dining options ensure all are catered for. With the sun ablaze, The Ritz-Carlton exceeds expectations and is a charming retreat for guests of all ages. The Ritz-Carlton spa features 9 treatment rooms, 3 individual private rooms, separate relaxation lounges and a hammam area. Facilities include an outdoor lap pool, indoor hot and cold plunge pools. Ritz-Carlton Dubai creates a memorable honeymoon for its guests. The Arabian themed building is a divine contradiction to the art deco interiors of the property. The sleekness of Ritz Carlton is exaggerated by its beautiful setting; abundant greens and soft beaches, the warm glistening waters and clear blue skies. With spacious suites, the rooms are simplistic in style but vibrant in colour. With different textures and materials, the perfect living space has been created for your honeymoon and the excursions offered by the hotel are limitless. The Emirates Golf Club is close by for golf lovers and for those looking to rejuvenate, the newly conceptualised spa is a great place to relax. For any honeymoon couple, privacy is paramount and the Ritz-Carlton Dubai caters perfectly; uninterrupted ambience. The fine dining options offer beautifully presented delights; a treat for you and your loved one. Ritz-Carlton Dubai is an oasis ideal for all honeymooners. With a limitless choice of dining options, you are treated to local delicacies and bites from Italy and Asia to name but a few. Amaseena provides an experience like no other. Sat under a lit tent, you are showered with local culinary dishes, some prepared infront of you. Listen to the sizzling of the lamb chops grilling and the fresh lobsters and salmon as they soften. Taking Arabian nights one step further, guests are serenaded with Arabian music so you can sashay the night away and with over 20 flavours of shisha, the Arabian adventure is never ending. Blue Jade – this cosmopolitan dining location brings pan Asian dining to its guests in authentic surrounds. Bamboos and wooden features only add to the majestic feel to this restaurant and the menu is heavily influenced by Asia, but adds a helping of chic and understated. Palm Grill overlooks the beach and you need not move very far. Sip on colourful cocktails and indulge in easy dining. Try the Omani lobster and freshly caught tiger prawns.